This giveaway is now CLOSED. Thanks so much to our wonderful sponsor Sakroots! We look forward to working with you again! The winner has been notified and upon confirmation, follower name will be posted both here and on our homepage. Remember: There are great giveaways active on the upper right hand side of the page! Bring It On Mother Nature! That's right, I said it! Bring it Mother Nature! I'm definitely ready for you this year! While I love the beauty of a snowfall on Christmas Morning, I don't exactly feel the same way while I am trudging to the bus stop and waiting in the freezing cold for my express bus into the City. I'm usually muttering something else at the sky while I'm walking in the slushy, icy and slippery streets that haven't been plowed yet because it's usually too early when I leave for work! But this winter, I'm totally ready thanks to Sakroots. I've been trying to break from my usual New York City Girl all dressed in Chic Black thing and have been actively trying to mix things up. It's much harder to do this with my basic wardrobe, but I'm finding it much easier to do this with my accessories like bags and boots! Ƹ̵̡Ӝ̵̨̄Ʒ - Heel measure approximately 1"
Ƹ̵̡Ӝ̵̨̄Ʒ - Platform measures approximately 0.75"
I've already had the chance to road test these in the snow, and they did not disappoint, I came home with warm, dry feet and tons of compliments! Ƹ̵̡Ӝ̵̨̄Ʒ - WIN IT! 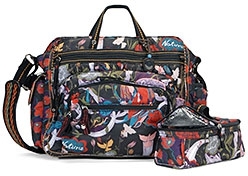 - Ascending Butterfly and our friends at Sakroots would like to put a Sakroots Black Peace Print Diaper Bag under your tree! Don't you just ♥ Sakroots? I know I do! (2)MANDATORY entry- Visit our friends at Sakroots and link me to another item you like other than the two mentioned above! On Christmas Eve, we usually go to a children's mass then come home for a hot toddy and to open one gift. Like the Sak on Facebook; told them you sent me. I really like the Artist Circle tote in boysenberry. I follow sakster on twitter. I like the Sak on facebook and commented that you sent me. I've joined your community chat group. I entered your Yoplait and KitchenAid giveaway. I like the Artist Circle Foldover Flap. Voted for ya on "Fuel My Blog"
I registered for a name on itsthoughtful.com and tried to vote, but it said voting was done. If you have another to vote on, let me know and I will vote! I have never really owned an umbrella because i dont want the typical..... i would LOVE TO OWN this one! I like this fabulous laptop sleeve! I love the Artist Circle Key Chain and I follow you via GFC (Bunny)! My night before Christmas ritual is having waffles for dinner. I follow @sakster on twitter-traymona. love the artist cirlce femme backpack! For Christmas Eve we go to my cousin's house in the morning to start the pig roast . . . the party goes way into the night and sometimes early Christmas morning! I like this umbrella http://www.thesak.com/store/productdetails2.aspx?productid=1285&colorid=1473&np=545&siteid=sakroots. I really like the carefree look of the Artist Circle Femme Backpack. My friend who lives in San Diego would love it! Following The Sakon FB and told them Ascending Butterfly Blog sent me. I follow your blog. The Janet Minis Crossbody Flap Handbag looks very nice! I tweeted the requested message at http://twitter.com/likwan/status/19414469486579713. I follow @sakster on Twitter under the name likwan. I follow The Sak on Facebook and let them know you sent me under the name Lily Kwan.